KIEV, Ukraine -- U.S. Senator John McCain has again called on the United States to send weapons to Ukrainian forces fighting pro-Russia separatists in the east of the country. U.S. Senator John McCain speaks at a press conference in Kiev, Ukraine, Saturday, June 20, 2015. The delegation traveled to Ukraine to meet with government troops and volunteers engaged in fighting against Russian-backed separatists in the east. McCain has been a lively supporter of legislation passed in the U.S. Senate this week that includes provisions to supply Ukraine with hundreds of millions of dollars in defence military equipment. 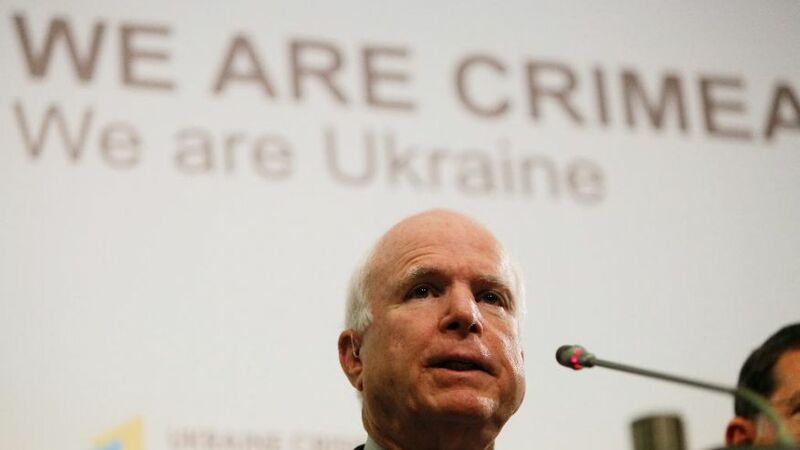 At a press conference in Kiev on June 20 with two other visiting U.S. senators, McCain (Republican-Arizona) said it would be "disgraceful and shameful" for the West not to act as Russian President Vladimir Putin, in McCain's view, sought to dismember Ukraine. McCain, one of the most vocal supporters in the U.S. Congress on arming Ukraine, said the Ukrainians had "proven they are willing to fight." "This is shameful that we will not provide [the Ukrainians] with weapons to defend themselves. They are fighting with 20th-century weapons against Russia's 21st-century weapons. That's not a fair fight," McCain said. Asked how to best counter Russian propaganda on Ukraine conflict, McCain said RFE/RL and Voice of America had been crucial to winning the Cold War. "One of the major factors in winning the Cold War without firing a shot was our information capabilities such as Radio Free Europe, Voice of America, it was beamed into the then-Soviet Union," McCain said. Speaking alongside McCain, U.S. Senator Tom Cotton (Republican-Arkansas) said Western leaders had offered Putin numerous "off ramps" to deescalate the conflict in eastern Ukraine, but Putin, according to Cotton, had ignored these chances. Now, Cotton said, was the time to start building "road blocks," including the supplying of arms to Ukraine's military. Senator John Barrasso (Republican-Wyoming) said he was impressed meeting "innovators" in Ukraine, including those building drone aircraft practically from scratch during a visit to Dnipropetrovsk on June 19. On June 19, the visiting U.S. senators met with Ukrainian President Petro Poroshenko, who thanked them for their support. Ukraine has repeatedly asked for international help to boost its defensive capabilities. Western countries have so far declined its requests to supply weapons, while offering nonlethal military aid and training. On June 18, the U.S. Congress passed the National Defense Authorization Act (NDAA), which includes a provision that would give President Barack Obama's administration $300 million for Ukrainian security assistance. U.S. military advisers are already training the Ukrainian military. About 300 U.S. paratroopers arrived in Ukraine in April to train Kiev's National Guard. Ukraine and the West accuse Russia of sending troops and weapons to the rebels fighting in the eastern Luhansk and Donetsk regions. More than 6,500 people have died in the over-a-year-old conflict. Moscow has denied playing a direct role in the fighting. On June 20, Russian President Vladimir Putin blamed the West and particularly the United States for the crisis in Ukraine and said the West should put pressure on Kiev to help resolve it.